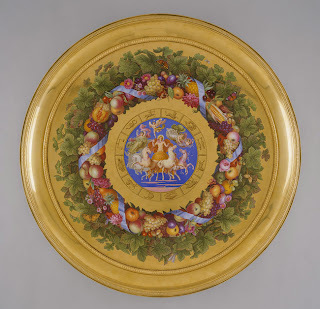 This Antique European style table is described in detail in the privy purse accounts of Friedrich William III of Prussia (1770–1840) as a gift from the king to Grand Duchess Helena Pavlovna of Russia (1806–1873) on June 1, 1835. The salon of her residence, the Mikhail Palace, which now houses the State Russian Museum, was one of the cultural centers of Saint Petersburg. Helena was a vocal advocate for abolishing serfdom, setting a courageous example on her own estates. 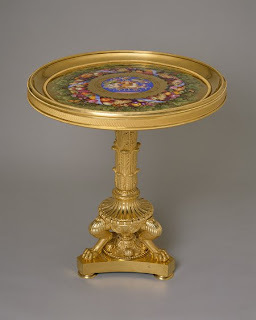 The Antique table is made entirely of porcelain with the exception of the gilt-metal rim of the top and the triangular base supporting the legs. It is the spectacular result of the new production and color technology that were developed after 1832 at the Berlin Porcelain Manufactory to attract royal patronage.